The picturesque monasteries of Ladakh stand tall on a hilltop showcasing the rich incredible cultural and spiritual heritage. The well preserved ancient monasteries with beautiful architecture, wood carvings, old valuable manuscripts, the gold, silver and bronze icons, stupas, Thanka and wall paintings will take you to a new journey and bring inner peace. According to the Tibetan lunar calendar, many monasteries in Ladakh celebrate annual festival. Among all these religious festival, the annual festival of Hemis monastery known as ‘Hemis Festival’ or ‘Hemis Tsechu’ attracts people from different corners of the world. Religious rituals, sacred mask dance are performed for peace, prosperity, and welfare of all sentient beings. Hemis monastery located 43 km southwest of Leh is one of the most famous monasteries of Ladakh. The monastery was founded by the great yogi ‘Staktsang Raspa’ and King ‘Singey Namgyal’. In 1730, Gyalsras Rinpoche initiated the famous Tsechu festival at Hemis and since then, Hemis festival is celebrated every year. Hemis festival is observed on the 10th and 11th days of the 5th month of the Tibetan lunar calendar (June or July) every year. 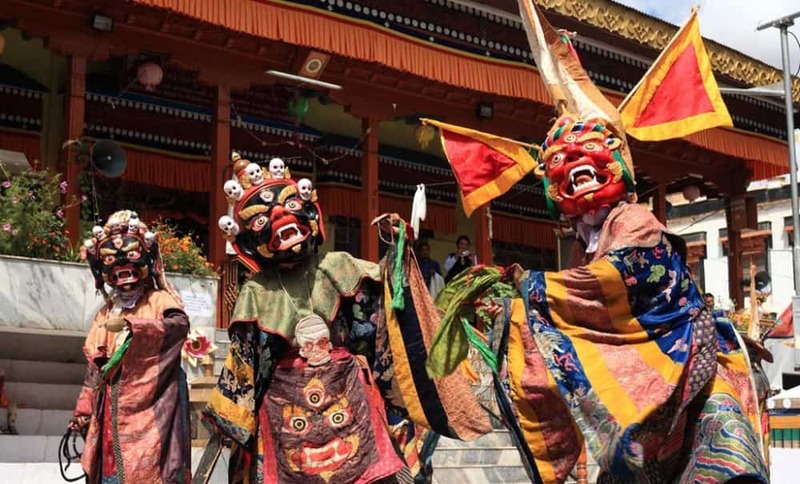 The celebration of Hemis festival in the Tibetan Monkey year which falls once after every 12 years is considered auspicious during which the spectacular 4 storey high Thanka painting of Guru Padmasambhava is exhibited outside the courtyard of the monastery for few hours. On the 9th lunar day, the monastery is decorated and final rehearsal of mask dance for next day is carried out. 1. The Thirteen Black Hat Dancers: Thirteen monks dressed in a tantric way represents the master of Tantric with supernatural power who drives out evil and negative influences turning the land into a positive one. 2. Consecration: Sixteen monks wearing a copper gilded mask carrying a small hand drum and bell perform the Dakini dance. They purify and bring down blessings to the land. 3. Eight Manifestation of Padmasambhava: Different forms of Guru Padmasambhava manifested at various point of his life are represented. Each manifestation of the Padmasambhava, ‘Guru Tsan gyat’ performs dance displaying the Guru Padmasambhava demonstration under different circumstances. Guru Tsokye Dorje : The mask dance manifests the birth of Guru Padmasambhava on a lotus flower in the lake of Dhanakosha in Oddiyana. Guru Padmasambhava: In this, the guru reached Tibet, subjugated all the evil powerful spirits and turned the wheel of Dharma. Guru Lodan Chog Sred: Lodan Chog Sred means “Wise seeker of the Supreme”. This is the form when guru learned all sutra and tantra scriptures from many great masters and sages. Guru Padma Gyalpo: It manifests when Guru Padmasambhava was invited by King Indra Bodhi Oddiyana to his palace and was adopted as his son. Later he married princess Odchangma and ruled the kingdom. He was then named Padma Gyalpo which means the ‘Lotus king’. Guru Nyima Odzer: Nyima Odzer means’ Sun Rays’ was named when Guru Padmasambhava was not harmed even after swallowing poison but became more radiant. Guru Shakya Senge: Shakya Senge means the ‘The Lion of Shakya’. Guru received teachings of maha-yoga tantra and gained miraculous power. Guru Senge Dradog: Senge Dradog, ‘The Roaring Lion’ was named when the attackers of Buddha Dharma was defeated. Guru Dorje Drolod: He concealed many profound texts and precious materials for the sake of a future generation. A prediction was made that the treasure teachings will protect the future. 4. The twelve Zhing Kyong: They are the protectors of truth. The main figure is the couple Zhing Kyong ‘Yab Yum’ male and female with lion faces. 5. Serkyem: Beverage offering is performed by the main teacher ‘Lobpon’ of Hemis. 6. The four Goma (Gate Keepers): They work for the welfare of sentient beings. The first one holds a hook that catches evil spirits, the second one with rope binds them, third with an iron chain, ties them and the fourth one ringing the bell drives them mad so that they cannot escape in any direction. 7. The four lords of the Graveyards: The mask represents human skulls and attired like a skeleton. The dance depicts the celebration of the victory of good over evils. 8. The five Chemchog Heruka: It is a fierce form of Guru Padmasambhava. Four Heruka is coloured red and the fifth one is dark brown. Evils are eliminated by wrathful means, liberating their minds and sending them to a pure land. 9. The Five Tshoglen: In a wrathful form, the first one is in red color, second in white, third in yellow, fourth in red and fifth in green. 10. The ten great Ging: In a wrathful form, a warrior flag on the head, tiger skin covering the lower part of the body, the dance drives away spirits and energies that can harm the dharma and sentient beings. 1. Thirteen black hat dancers: Similar to the one performed last day. 2. Worship of Gyalpo Pehar (Dharmapala): Gyalpo Pehar is the protector of Hemis. The monk assembles in the main temple and worships Gyalpo Pehar. 3. The Eleven Acharyas: The eleven acharyas, followers of Gyalpo Pehar holding a Vajra and mirror performs the dance. 4. Maning: Maning are the protector Mahakala. The yellow, white and red maning along with four formations of the Gyalpo followers perform the sacred dance. 5. Serkyem: Beverage offering is performed by the two main teachers of Hemis and Chemdey along with two dance masters. 6. Mahe Dongcham: It is a buffalo face mask dance led by a wisdom deity. It destroys an effigy which represents those who committed ten most destructive crimes. 7. Hashang and Hatruk: Hashang smiling Buddha expresses inner peace of mind along with his disciples Hatruk. The Hatruk performs playful, childlike dance. With this, the famous Hemis Festival celebrating Guru Padmasambhava or Guru Rinpoche ends. It is believed that whoever attends Hemis festival acquires merit, brings positivity and eliminates misfortune.